Mysore bonda is a most popular snacks from Mysore and also very popular in Andhra Pradesh. They are dumplings made from maida and rice flour. Very simple and kids also love them very much. While preparing and consuming such kind of dishes should not think about calories, just enjoy them to the brim. As I made first time I have added very less ingredients, but we can also add curry leaves, coconut pieces. The crispy outer layer and the aroma of sour curd fried in oil drag people to the table. I have learned them from my friend, Susila, who is very expert in making such kind of evening snacks and tried there itself with the batter available. And again gave a try in my house and they are very tasty and nice. 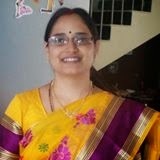 She made two varieties of them one is Mysore style and the other one is Andhra style. 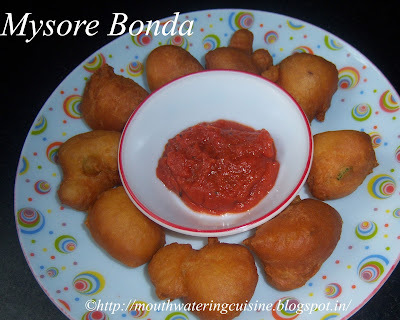 Mysore style bonda is made with flours and Andhra style are made with the urad dal. I find the first one is very easy and can be made any time. Sambar bonda is a very popular breakfast dish in some places in Andhra Pradesh. In a mixing bowl, take 1 cup of maida and 1/4 cup of rice flour. Add in baking soda or cooking soda, salt. Mix the dry ingredients well. Chop ginger, green chillies, mix them in the flours. Add in sour curd or buttermilk to it. Buttermilk is the best option. It should sour in taste. The batter should be a little thick than that of idly batter. Allow this batter to rest for one hour. The batter becomes a bit thin, need not worry. Heat enough oil in kadai for deep frying. Check the heat of oil by dropping a small bit batter, if it comes up immediately, oil is ready for frying. Drop a spoonful of batter in the hot oil, it sizzles and comes up. In the same way drop as many as can be fried at a time. I did not use any spoon, used my hand only, took some portion of the batter and slowly and carefully dropped it into the oil. Of course this way we may not get proper shape bondas. Do not over crowd it. For me four to five bondas for one batch. Fry them in the low flame. If we fry them in high flame, they become crispy outside but do not cook inside. Fry them till they turn into brown color and crisp outside layer. 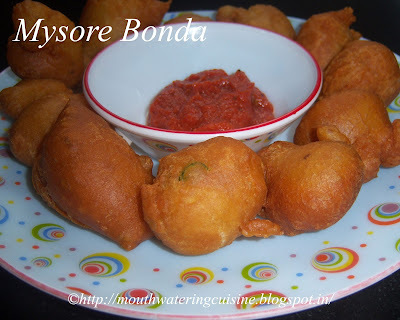 Serve hot mysore bonda with any spicy chutney.